For a wide variety of activities. For balance beam or long jump. How will you use the Multi-Purpose Mat? Let's look at the options! 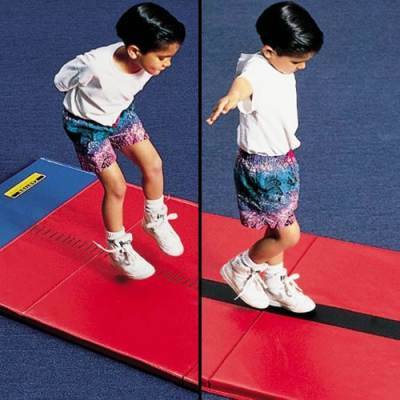 This unique folding mat has a 4"W stripe silk-screened down the middle of one side to simulate a balance beam for aspiring gymnasts. The other side is marked in feet and inches to 10'9" and can be used for practicing long jumps with a 3' x 1' blue takeoff area. Either side can be used as a 12'L x 3'W standard tumbling mat. Filled with 1-3/8" cross-link foam and covered in heavy-duty vinyl. Meets California Fire Marshall specifications for flammability. Available in Red only. Get them started early while keeping them safe and grounded, with the Multi-Purpose Mat.